It was about as rough a weekend as any high school athletic team could possibly have. Unfortunately, it just happened to be the Crested Butte Titans girls basketball team’s weekend, as they fell to 2A powerhouses Del Norte and Sanford on Friday and Saturday, January 11-12. 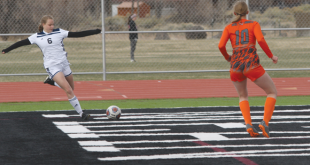 There was no doubt these games were going to be tough, as both opponents have long-standing very successful programs, while the Titans continue to focus on building the girls program from the basics with their eyes on the future. But this weekend was a serious test of the Titans’ resolve as they fell to Del Norte 86-21 and then to Sanford 93-16. “It was a little rough,” says coach Vaden Holmes. The Del Norte game started out okay for the Titans. In past years Del Norte would build a massive lead in the first quarter and go from there. This time around, the Titans showed some spark before Del Norte’s play eventually wore them down. A little bit of everything proved too much for the Titans over the course of four quarters as Del Norte maintained their pace the entire game to run away with the 86-21 win. The Titans looked to rebound and put up a better effort against the Sanford Indians on Saturday. Again, Sanford, just like Del Norte, has the potential to go far in the post-season and is a tough match-up for the Titans. Size-wise things looked good prior to the game as the Titans appeared to match up well with Sanford. But that was about it as the speed, tenacity and skill of Sanford, coupled with fatigue of Crested Butte from the night before, resulted in another brutal loss. Sanford built a 32-7 lead in the first quarter and continued to pour it on all game to cruise to the 93-16 win. While both games resulted in sound defeats, Holmes still sees glimmers of growth from her players compared to what they were doing last season. 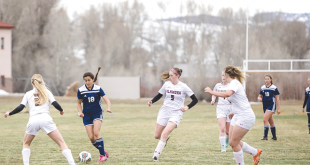 The girls will host South Park on Friday, January 18 with the varsity game starting at 5:30 p.m. It’s part of Family Fun Night at Crested Butte Community School and everyone is encouraged to come to support your high school athletics. The Titans will then hit the road on Saturday to face Center. “We were pretty green last year when we played these teams so I’m hoping for a better match-up this year,” says Holmes.